The IAR 330 is the Romanian-built version of the Aérospatiale SA 330 Puma helicopter, manufactured by IAR Brașov. Twenty-four helicopters were upgraded to IAR 330 SOCAT in cooperation with Elbit Systems (Israel). Despite being a COMECON and Warsaw Pact member, Romania strove for some measure of independence from the USSR. 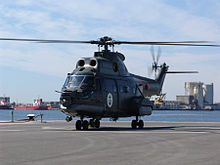 Instead of buying popular Soviet designs, Romania bought a licence to manufacture the French Aérospatiale SA 330 Puma on 30 July 1974. The first licensed helicopter was flown on 22 October 1975 under the designation IAR-330L. At least 163 of these helicopters have been built, out of which 104 were assigned to Romania's military, 2 were retained by the manufacturer and 57 were produced for export (Pakistan, Ivory Coast, United Arab Emirates, Sudan, Ecuador). There is also a search and rescue (SAR) version, fitted with inflatable floats for emergency landing at sea, which has been built in a small batch. Production is still ongoing at the Industria Aeronautică Română plant at Ghimbav near Brașov. In the 1990s, the Romanian Air Force decided to enhance the combat capabilities of the IAR 330L, making it a universal anti-tank and support helicopter. At that time, Romania started to cooperate with Israel on some military programs. The Israeli company Elbit Systems was chosen, and in September 1995 the Romanian Air Force signed a contract to upgrade 24 helicopters with the SOCAT system (Sistem Optronic de Cercetare și Anti-Tanc). The first IAR 330L SOCAT was flown on 26 May 1998, from IAR's airfield in Ghimbav, near Brașov. On 23 October 1999, the second prototype flew. The first IAR 330L SOCAT was delivered to a combat unit in 2001. In all, 25 SOCATs were made, including the prototype, rebuilt to production standard in 2005. The IAR 330M NATO is a modernized transport version with the SOCAT version's avionics, but without weapons and optronic systems. Among others, it has a weather radar. Twelve IAR 330Ls were modernized to 330M standard between 2005 and 2008. The first IAR 330 NAVAL helicopter was officially unveiled at Ghimbav on 30 January 2007. The Romanian Naval Forces ordered three of this variant. The helicopter is in a similar configuration to the Romanian Air Force variant, including the SOCAT upgrade package; the Navy aircraft also have flotation gear fitted under the nose and main undercarriage fairings. They are operated from Navy frigates for search and rescue, medevac and maritime surveillance missions. IAR 330 Puma NAVAL variant. IAR 330H – initial model (1975–1977). IAR 330L – improved model (1977–present). IAR 330M – modernized variant. IAR 330L SOCAT – attack helicopter. IAR 330 NAVAL – naval helicopter. IAR 330 SM – export configuration for UAE. An IAR 330 was presumably shot at and crash-landed on December 23, 1989 during a transport flight near Alba Iulia, killing the crew of three and two passengers. An IAR 330 SOCAT crashed on August 16, 2001 during a training flight shortly after take-off from Titu Air Base. The crash occurred at an altitude of 50 meters (165 ft.), wounding the crew. An IAR 330 SOCAT helicopter, belonging to the 90th Airlift Base, crashed on November 7, 2007, in Ungheni, 30 km south of Pitești, Argeș County, during a night training mission, killing all three crew members. An IAR 330 SOCAT crashed on March 7, 2013 in Berești-Bistrița, near Bacău, during a training flight, killing two crew members and wounding three other crew members. Romanian Air Force and Navy grounded the entire IAR 330 SOCAT fleet pending an investigation into the crash. An IAR-330 MEDEVAC crashed on November 21, 2014 in Mălâncrav, near Sibiu, during a training flight, killing eight military personnel and injuring two others. ^ First IAR 330 Puma Naval helicopter enters Romanian Naval Forces service Archived 2008-06-23 at the Wayback Machine, Ziarul Financiar, July 12, 2007. Retrieved on July 20, 2008. ^ a b c d e f g "Arms Transfers Database". Stockholm International Peace Research Institute. Retrieved 19 February 2013. ^ a b c "World Air Forces 2013" (PDF). Flightglobal Insight. 2013. Retrieved 15 February 2013. ^ "Lebanon takes delivery of three more IAR 330 Pumas". Janes-Defence-Weekly-2010. Retrieved 17 February 2013. ^ Carol Harsan (December 18, 2007). "Oameni-cheie ai Revolutiei au murit suspect". romanialibera.ro (in Romanian). ^ Helicopter crashed near Piteşti killing three people aboard, Antena 3, November 7, 2007. ^ "Helicopter crashed near Bacau killing two and wounding three crew"
^ "8 Military Dead in Helicopter Crash in Romania"
^ Lambert 1992, p. 193. Lake, Jon (Fall 2001). "Variant File: Aérospatiale SA 330 Puma". International Air Power Review. Vol. 2. Norwalk, Connecticut USA: AIRtime Publishing. pp. 96–107. ISBN 1-880588-34-X. ISSN 1473-9917. Lambert, Mark, ed. (1992). Jane's All The World's Aircraft 1992–93. Coulsdon, UK: Jane's Defence Data. ISBN 0-7106-0987-6. Wikimedia Commons has media related to IAR 330. This page was last edited on 7 November 2018, at 21:30 (UTC).